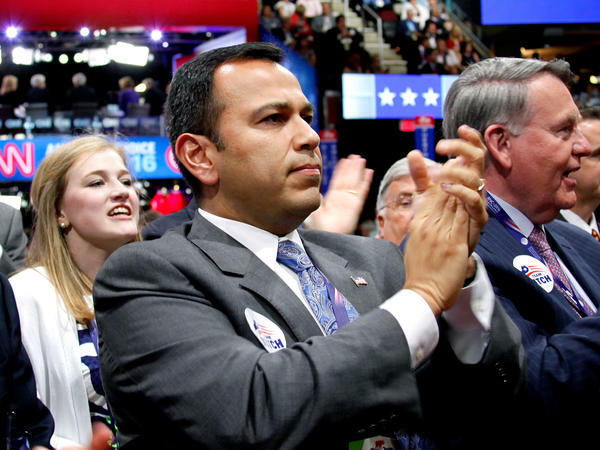 Ralph Alvarado, the first Hispanic elected to a state office in Kentucky, will speak at the Republican National Convention during prime time Wednesday. 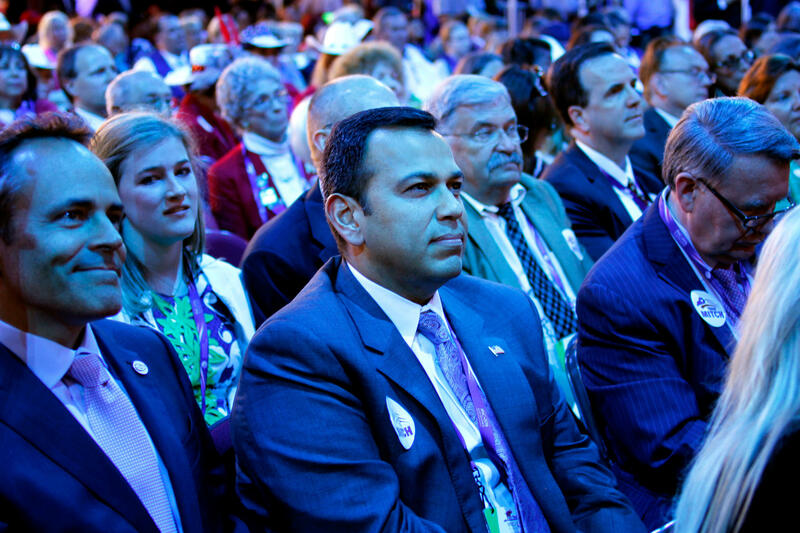 Ralph Alvarado, the first Hispanic elected to a state office in Kentucky, watches the stage on Tuesday evening. Alvarado will speak at the Republican National Convention during prime time Wednesday. The other man, Ralph Alvarado, is a little-known state senator from Kentucky. Alvarado, 46, is also a doctor and a delegate for his home state. And in 2014, he became the first Hispanic elected to state office in Kentucky. In an interview at the Quicken Loans Arena between floor speeches, Alvarado took some time to chat about Trump, Hispanics and the Republican Party. "Back about three months ago, I wrote an email to people that I know that were kind of connected to national campaigns, expressing my concern for where things were going as far as the dialogue, the talk about Hispanics, and that sort of thing. And, I said I wanted to make sure that somebody at this convention will give a speech about what Hispanics are — that it's not that we're a bunch of refugees coming across the border, which is what I think a lot of people think that Latinos are." A couple of months of later, Alvarado got a call from the Trump campaign inviting him to speak in Cleveland. The state senator from Kentucky admits that Trump was not his first choice. "My first choice was Rand Paul back in Kentucky. When he dropped out, I kind of got behind Marco Rubio. When he dropped out, I thought — I'm zero for two, might as well just keep it where it's at," he said. Even though the businessman-turned-politician wasn't his top pick, Alvarado says he's now fully behind Trump as his party's choice, and he wants to help him get elected over Hillary Clinton. "For me, I look at somebody who's brutally honest to somebody who's dishonest. And, so even though he may not say the things the way you want him to say it, he is an honest guy and he's straight up on things," he said. But some of Trump's brutal honesty regarding Hispanics has troubled Alvarado. He says the way Trump referred to the Hispanic judge overseeing a fraud case against Trump University was "inappropriate." Trump called the judge a "hater" and insisted he was being unfair because he's a "Mexican." "That comment bothers me, of course," said Alvarado. "You know, I'm like that judge. I'm a physician. I'm a son of immigrants .... No one can come to me and say you're gonna treat me a certain way as a doctor because of your Hispanic roots, your background, we don't do that." But when it comes to Trump's immigration ideas, Alvarado is more sympathetic. He says people have to follow the immigration rules, and some Latinos are frustrated by those who don't because illegal immigration makes the entire ethnic group look bad. Tonight, Alvarado wants to humanize Hispanics. He thinks he can help the party with minority outreach. "We've got to get the right people, and I think I can hopefully provide at least for one night a fresh face with a perspective of a son of immigrants to say here's what I think is important. Here's what I think all Hispanics share with Republicans as far as our values," he said.